For years, those who are dealing with severe disabilities and illnesses that keep them bedridden have been bound to lie horizontally for much of their lives. Whether in a hospital, a rehabilitation center, or even one’s home, even the best adjustable beds have an incredibly limited range of movement. 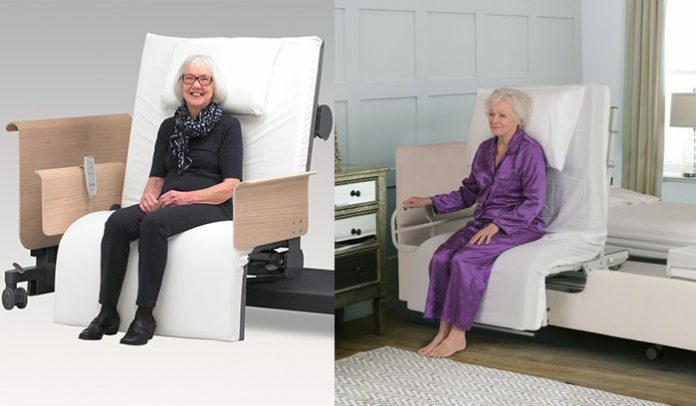 With this in mind, companies like Theraposture and RotoBed have crafted an entirely new kind of adjustable care bed that’s aesthetically pleasing, innovative, and highly practical. These rotating beds are designed to help those who have a difficulty getting out of bed to do so with minimal effort. With the help of a caregiver, the entire mattress portion of the bed raises, rotates, and moves into a chair-like position that the person lying in it can easily exit. This simplifies the act of getting out of bed and makes it easy for caregivers to move those with disabilities from their bed to a nearby wheelchair. If the patient needs the ease of getting out of bed that the rotating bed provides but does not have a caregiver who can perform the actions needed, all the patient has to do is push a button and the bed will do the rest, leaving the patient in a seated position and giving them the opportunity of exiting or sliding into a wheelchair. The rotating bed created by RotoBed sits as low as 32cm above the floor and can hold a user with a maximum weight of 190kg. On the other hand, the RotoFlex by Theraposture offers 5 variants, with the heavy-duty RotoFlex 300 able to handle users weighing up to 250kg. These beds are made to holdup over the long-haul. Countless caregivers and institution managers have given testimonies about the value and power of rotating beds to help patients with limited mobility. They’ve reported an increase in quality of life for patients, a decrease in their pain, and an all-around better working environment for everyone. Rotating beds have already transformed the lives of hundreds of people. They’ve allowed patients to have greater mobility – and freedom. They’ve helped caregivers with tasks that used to be difficult and physically straining. And they’ve helped organizations lower costs and make their teams more effective. The Theraposture RotoFlex range of beds cost anywhere between GBP 6,450 to GBP 10,750 – depending on the variant you select. For the RotoBed brand of beds, we could not find a listing price on their website. They suggest contacting them for a price quote. Necesito informes precios y donde las venden. Is It Covered Though Medical Insurance? Do I Have To Pay Outta Pocket? So what is the cost of the bed? Awesome! How can I invest??? I live in the United States. How can I have this product here? Are these available in USA? Can you email me prices on your rotating bed please . Very interested ? gracias, me interesa por la actividad que manejo con personas mayores, hay posibilidad de representacion? Hi Wonderful just wonderful. How those bed would be so used and much needed in out home for the elderly. If I may enquire how much is a bed in South African rands. We are a NPO based in Krugersdorp Gauteng, South Africa we focus on caring for the elderly and we have many residents who are bed bound and this bed would be wonderful. What is the price for a rotation bed. I like to get one for mother in law for her 100 years birthday. Where in the USA can I get pricing and info on this bed. Please let me know. I would like more information on the Rotating Bed…..The price where and how can I order it. How can I get more info. Such as price and where to get this? Hi Tracey, the approx. cost is mentioned in the article above. You can visit the manufacturer’s website (link in the article) to know the prices for each model. I acquired a Rotoflex bed in 2016. Theraposture does not have a sales distributor in the USA or Canada but will sell directly to individuals through an export process. The cost varies on exchange rates. Would really love to get some information on this bed. Husband is bed ridden . This would help me a lot!